Dateline New York. 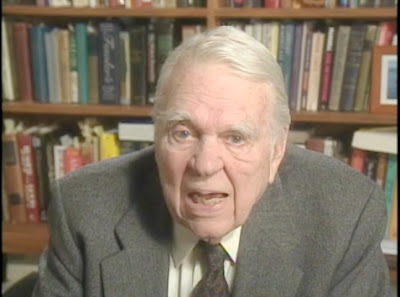 Andy Rooney, a man who from time to time rails against infants and is driven crazy by the fact that coffee cans are a) not the primary container in which coffee is sold from anymore (paper sacks) and b) are no longer filled to the “tippy-top”, is apparently unfazed by giant, two-inch long eyebrows. Although Rooney, who’ll turn 109 next week, hasn’t officially stated his fondness for eyebrows that, come on, let’s face it, have to occasionally obstruct his vision, those familiar with the 60 Minutes commentator feel that a man who has repeatedly bashed the milk industry for overwhelming him by offering 2%, 1%, Skim and Whole milk, all at the same time, would have said something now about long eyebrows if in fact they caught his ire. “We know how he feels about having to watch dog food commercials and what he thinks of fabric softeners, I don’t know why he’s being so coy about the eyebrows.” said one woman who preferred to remain anonymous as to not attract Rooney’s wrath. Among other items suspected to not bug Rooney, who’s heart scientists estimate beats an astounding 3 times per minute, are “longer than they have to be” yellow toe nails, jowls and ear hair.